Duplicating historical battles, players may find the standard 12 element per army falls short of the image we have of large barbarian forces fighting a small but disciplined Roman army. 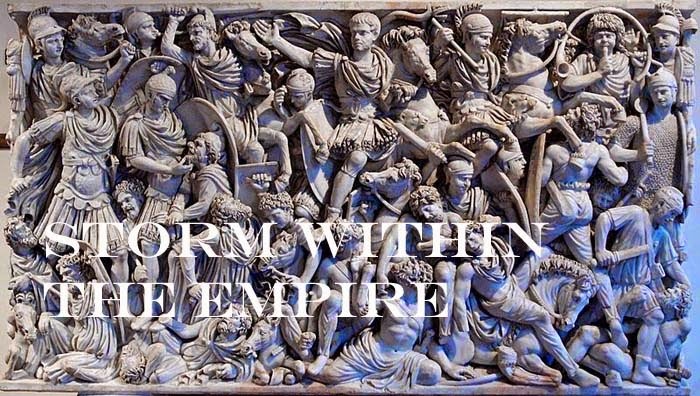 As part of my ongoing development with campaign rules I decided to address this and experimented with a large barbarian army of 18 elements to fight a standard Roman army of 12. Romans have deployed in a standard battle formation with two vexillations of legions flanked by auxilia. A reserve of cavalry forms up as a second line. Just behind the Roman left is a gentle hill and on the right are two woods. The Germans have formed their three groups (sub-tribes) with their chieftain (C-in-C) taking a central position. The Roman legions have dropped back to the base of the hill opening up a corridor for the reserve cavalry to move through. The barbarians, undaunted move forward. In a surprise move, the auxilia supported by the Promoti launch an attack on the German right which helps fragment their assault. The legions supported by the general and his guard now attack the main barbarian columns while the reserve cavalry launch their own attack. Both German wings have been shattered and are now trying to hold their ground (demoralised) while the centre still pushes on to hopefully carry the day. The German centre finally cracks leaving the Romans holding the field. Score 9 – 3 a victory for Rome. Rome rests the left flank on wood, but the presence of a marsh and a second wood prohibits any deployment in depth. The Germans form up in a similar formation as before and will attempt to contact the Roman line in one massive rush. Rome recalls the auxilia on the left to redeploy on the second wood and the legions brace themselves for the barbarian assault (poor pip score). The legions prove successful at pushing back the German wave, but elsewhere the casualties begin to mount. At this point, the Germans catch their second wind to break the Roman centre. Two of the German sub-tribes have lost their momentum (demoralised) but still hold their ground. With the legions destroyed, the commander calls a general retreat. Score 5 – 4, a German victory. The barbarians have secured ideal terrain for a defensive position, but that idea is not their intent. Rome has a gentle hill on which the legion and auxilia form up. This time, the cavalry will take a pro-active role and form on the left flank to support the second legion leaving the commander to form the only reserve for the army. As the Germans rush forward, the legion and auxilia move to the forward slope giving the archers an opportunity to harass the barbarian cavalry. The second legion is feeling the ‘heat’ as the barbarians draw nearer. The entire Roman left moves back luring the barbarian horde further forward. This opens a gap which is filled by the commander and his guard. The barbarian left wing is shattered but they do hold their ground. Their fate is unknown to the remainder of the horde as they press forward. The battle reaches a critical point as Roman casualties mount. The Germans are now surprised as Roman assistance comes sweeping down the hill and the Promoti (LH) have moved to support in time the Roman left flank. This last move retrieves the situation bringing all three sub-tribes to exhaustion and they leave the field to the Romans. At a heavy cost Rome claim a victory with a score of 7 – 3. Next post will have an assessment and its further application for other periods.